Modern &#8216;Subsistence Wages&#8217;: Worse Than Marx and Engels Would Have Imagined? Modern ‘Subsistence Wages’: Worse Than Marx and Engels Would Have Imagined? When we hear talk about “subsistence wages”, the first associations that are likely to come to mind are “exploitative” wages and practices in Victorian England mines and sweat shops of the sort Karl Marx and Friedrich Engels railed against a century and a half ago (despite reported huge gains in industrial worker income and living standards). 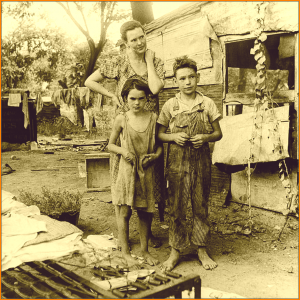 Or maybe you imagine the wages of indigent migrant and casual laborers struggling to survive during the Great Depression. But, in 21st-century Western societies in which subsistence existence is supposed to be encountered only in museum exhibits of life on prehistoric African savannahs or in famine-stricken Pilgrim settlements and the like, the catastrophic recession of 2008 has pushed many workers to the brink of warranting a future exhibit of their own. Although we all have a vague idea of what “subsistence” means, a closer, discerning examination will reveal what it is not, despite any tendency to confuse it with something else, while revealing how, in terms of economic theory, it is now for some workers and in some sense harder to demand and get a subsistence wage than in Marx’s day, at the dawn of the Industrial Revolution and in its full-throttle Victorian mines and factories. What Is a Subsistence Wage? Work in its most economically primitive and unrewarding form provides only bare-bones (or skin-and-bones) survival-level subsistence (with or without topping off by outside help from friends, neighbors, community, church or government). “Unrewarding”, in this connection, primarily means “economically unrewarding”, although it is a challenge to imagine how subsistence employment in its most extreme forms can. apart from income, otherwise be rewarding, if all of one’s energies and time are consumed by work and solely for the purpose of perpetuating and sustaining that work (if not also one’s progeny and genes). It is a challenge, but not an impossible one: Conceivably, some subsistence work might be intrinsically self-rewarding (in non-economic) terms, e.g., the job of a passionate painter, who would otherwise paint for pleasure and for free, if (s)he didn’t have to eat. Conceived as the lowest wage upon which a worker (and his or her dependents, if (s(he has any) can survive, the concept and forms of “subsistence” have migrated from the glossy pages of economics textbooks to urban main and mean streets all over the world, after millennia of human experience of it in pre-industrial societies. Until recently, subsistence employment in developed nations and in its most extreme form was largely only a remote academic, abstract, National Geographic, Discovery Channel or historical topic; however, increasingly it appears to be, for many, becoming an all-too-real real-life issue and hazard, even among those not yet homeless nor unskilled. Distilled to its extreme minimalist essence, subsisting with a subsistence income or comparably meager compensation package (e.g., through barter) means existing to work and working to exist, with “quality of life” then being entirely dependent upon how intrinsically or otherwise non-economically rewarding the job is and how much free time it allows, despite the impossibility of accumulating any wealth in the form of capital or disposable income or other resources. Subsistence employment has to be distinguished from a “subsistence economy”, defined as an economy which is not based on money, in which buying and selling are absent or rudimentary, even though barter may occur, and which commonly provides a minimal standard of living. Given this standard definition, unless economic collapse, nuclear winter or some other apocalypse propels us back to a Stone Age, subsistence is likely to take only the form and energies of subsisting individual lives rather than of whole economies. Subsistence employment also has to be distinguished from the specific dollar amount defined as a “subsistence income”, e.g., a cited 2005 World Bank global estimate/definition of an average of $1.25 per person per day as the subsistence-level poverty line. Any cash criterion of subsistence is likely to vary regionally and nationally (despite the World Bank international figure), while obscuring the facts and circumstances that define and create (mere) subsistence. Likewise, the so-called “subsistence allowance”, as, in one of its forms, compensation on top of wages or salaries for the basic necessities of life. is a luxury that those just subsisting do not enjoy. —Living Wage: Not to be confused with “basic income” (which is an unconditionally guaranteed income, rather than a wage), a “living wage” is commonly defined as the minimum income necessary for a worker to meet individual (and family) needs that are considered to be basic and indispensable for quality of life, such as food, utilities, clothing, transportation, health care, minimal recreation (and, in the U.K.,one course a year to upgrade their education and childcare). If the accepted concept of a living wage includes affordable health care and recreation, it may be argued that any worker without these, whether for lack of money or time ( because of long work hours, in the case of recreation or insufficient free time to schedule medical appointments and treatments) is closer to living at a subsistence level than to having a living wage. That subsistence level shortfall increases if a living wage is also conceived as being able to afford retirement savings, debt repayment, educational expenses or care-giving for elderly relatives. —Minimum Wage: Because a minimum wage is usually sought and set as a legally specified and mandated income amount, rather than defined in terms of the categories of things it makes affordable as essentials, it cannot be considered a conceptual or monetary equivalent of a subsistence wage. Given the necessary indebtedness in order to survive for many on minimum wage, borrowing to survive is, in many instances, tantamount to a second form of “hidden subsistence”, just as abstaining from having children for economic reasons can be. On the other hand, some minimalists (practicing the art of lifestyle “packaging to price”, discussed below, may find a minimum wage more than adequate, as they minimize their needs in alignment with their minimum wage. That’s because, for example, the quartile criterion ensures that those in the bottom 25 % will be called “poor”, irrespective of whether they have air conditioners, cars, adequate food, affordable housing, or even a swimming pool and helicopter (in a hypothetical society in which everyone can afford one of each). Yes, a war on poverty can be “won” through the complete and absolute elimination of income inequality (unless everybody ends up at a subsistence level or otherwise equally poor). But, as I just noted parenthetically, income equality does not equal prosperity. Therefore, a poverty threshold defined in “relative poverty” quartile, median or similar statistical terms neither specifies, exceeds, nor falls short of a subsistence-level threshold defined in resource-access terms, especially given the historical and individual variation in what is deemed to be a household “necessity”. On the other hand, an “absolute poverty” threshold (defined in terms of having or lacking the bare necessities of life) more closely approximates and accommodates our intuitive notions of subsistence. Other poverty-level concepts set their thresholds well above subsistence, to the extent that they do not factor “in-kind income” benefits, such as food stamps, family-provided or financed housing, charity, and services exchanged or paid in goods as “income”. With in-kind income, some luck (e.g., in finding cheap, but good housing) and simple tastes, some that are living at government dollar-denominated poverty thresholds, e.g., the 2013 U.S. Health and Human Services $11,490 ($957/month) threshold for a 1-person household, may do better than merely subsist, despite being below the “poverty line”. In marketing, there is a practice described as “packaging to price” which has an unexpected connection to and analogue in subsistence existence: Instead of raising prices of a product when costs of production rise, manufacturers will often reduce the size, weight or quality of their wares, to sustain sales at the existing price, e.g., of a chocolate bar that gets slimmer, with fewer nuts per bar or with more cheap peanuts and fewer costly almonds. When Marx, Engels and other classical economists conceptualized a subsistence wage, a common notion was that it is the wage just sufficient to enable a worker to work and replace himself with his children as the next generation of toiling tadpoles in the labor pool (when child labor was still common). This meant, like it or not, an employer had to pay enough for his workers to raise, feed, clothe and otherwise tend to the needs of their children as well as of themselves. What the classical economists of yore probably did not anticipate was the modern phenomenon of the “DINK”—the double-income-no-kids family as a subsistence-level family’s way of packaging their own labor to price, by designing their families to keep their jobs at the employer-offered price, i.e., wage, they are able to fetch for their labor, without raising that price through wage demands and risking losing their resistant employer as their “customer”. This has been accomplished through the same technique as that utilized by chocolate bar manufacturers facing cost-push inflation of their prices: size reduction of the number of workers per family, through childlessness (thereby skimping on the replacement workers, like skimping on the almonds and chocolate) which eliminates the cost-push pressures to demand a higher wage for their DINK labor. The analytical consequence of this is that, from the classical perspective, modern economies feature “hidden subsistence”, to the extent that struggling DINKS would not meet the classical criterion of adequate subsistence wages if they were to have children, because, economically, they would not be able to meet the cardinal criterion of a subsistence wage: economic, if not literal, survival of themselves as a family unit that includes children. “The people who consistently rank in the worst financial trouble are united by one surprising characteristic. They are parents with children at home. Having a child is now the single best predictor that a woman will end up in financial collapse. A more easily foreseeable change, relative to the classicists, in the concept and provision of a subsistence wage is that brought about by mechanization (something quite familiar to Marx and his contemporaries)–now advanced to include robotics and AI software. The most dramatic change in the concept is that childlessness of worker families is no longer a “problem” for the employer class: Whereas, however reluctantly, Industrial Revolution-era bosses had to pay enough for a worker to support his dependents, the modern employer does not have to when there are none, namely, no stay-at-home wives nor children. Theoretically, this should create downward pressure on subsistence wages, whatever the dollar amount, especially if “subsistence wage” is defined classically, since the workers’ list of essentials and associated work demands, given that needs of (non-existent) children are eliminated, is shorter and more negotiable. This means that employers cannot be pressured by the fear that worker childlessness will mean future labor shortages and therefore higher wages or unfilled jobs. That’s thanks to the robots and AI, which are creating a situation in which employers not only can tolerate widespread childlessness among workers, but actually welcome it (because of the affordability, reliability, compliance, etc., of a robot workforce,e.g., at Apple’s China Foxcom operations, where plans to utilize 10,000 robots are making human workers expendable). …assuming they allow us to exist, let alone subsist, at all.